If you have been to Greece, the chances are you’ve tried souvlaki or kebab (or both!). Especially during summer, you probably go from souvlaki to watermelon and back. Or at least I hope you do, because to me these are the highlights of Greek fast food. And boy, we have a strong fast food identity. Unfortunately little of this has escaped abroad, but the truth is we Greeks really love the stuff; and when it comes to souvlakia, we don’t compromise on quality. Fast food and take-aways throughout Greece have a unique identity. So unique, we almost managed to force out McDonald’s. Along with the international brands, we have many national and also regional chains (e.g. exclusive to islands). Thanks to our love-affair with fast food, there is an abundance of places offering quick snacks that could well be a meal in themselves. Bakeries are a great example, the selection of pies & sweets you can take away is mind-blowing, especially because they often double-up as patisseries. Modest establishments will have a small selection of cookies and pies, but the more you look around the more treats you are going to find: traditional syrupy baklavas and galaktoboureko, macaroons, cookies, cakes, authentic chocolate gateaux, ice cream cakes… you’re only limited by your own imagination. Every neighbourhood will have at least one local souvlaki and one local pizza place. And whilst pizza is ideal for accompanying movies on a lazy evening in, you can grab a souvlaki anywhere and take it wherever you go. It is our national hero. It can be your lunch, dinner or breakfast after a late night out. You can find this versatile snack on the beach or even up a mountain. It accompanies you on an evening stroll, it’s a treat for the kids, a student’s staple and part of your Sunday barbecue. It’s juicy, yummy, super-easy to make and always there when you don’t know what to cook. And of course I have been treated to my own souvlakia. These home-made BBQ skewers are a lean version. You can cube any meat of your preference, I would normally go for pork or chicken. Slide a few pieces onto the skewer and if you like it juicy, alternate with some cherry tomatoes or peppers. 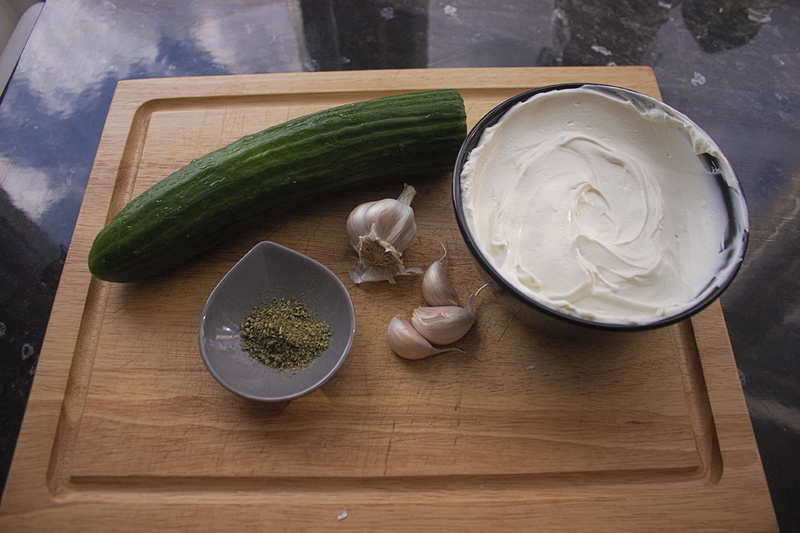 Grill some pitta bread too and I hope you didn’t forget the tzatziki! 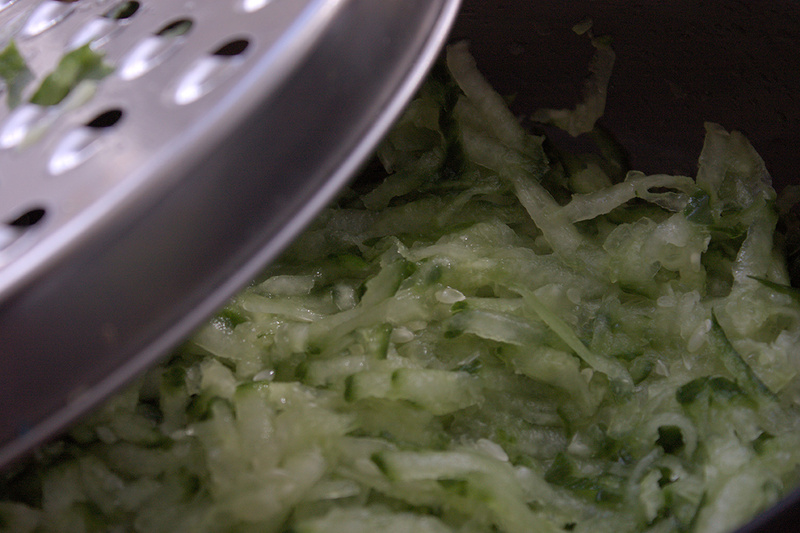 You can now combine the grated cucumber and yoghurt. Add the olive oil and vinegar. Mix very well to get a smooth homogeneous texture. Finally stir in your herbs, and you are done! Chill and enjoy. 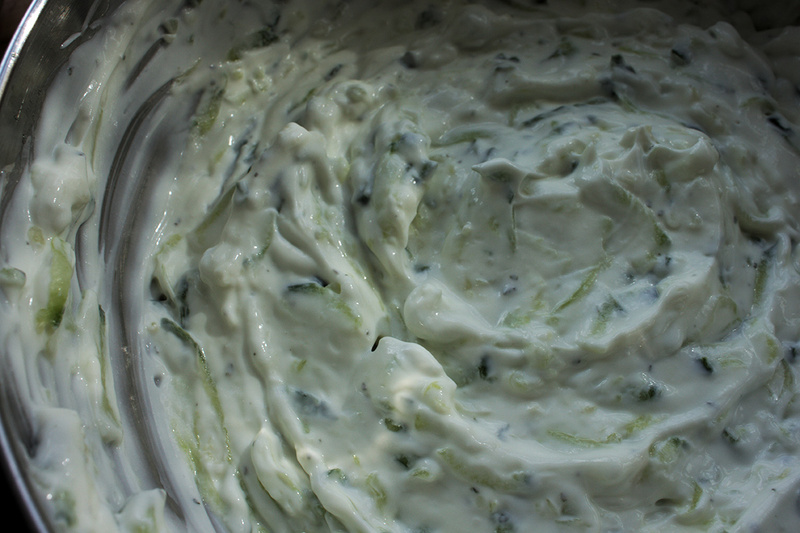 TIP: The flavours become deeper if you leave the tzatziki overnight in the fridge; so if you’re having guests, you can prepare this the day before! Excellent yogurt sauce to have with lamb ! I am making Greek style fast food all the time now !